Nero 9 is a suite of optical disc authoring software program from Nero AG, formerly Ahead Software, with its core principal product of Nero Burning ROM (aff), with Nero Express, a simplified edition of Nero Burning ROM served entry-level users. Many users have been familiar with Nero brand as Nero OEM suite are bundled with many optical disc recorders or CD/DVD-RW drives. Nero 9 complete suite of software which supports CD/DVD, Blu-ray and HD DVD burning (aff) is not cheap though, with single license purchase costs $79.99 (aff), and end-users will get lots of unwanted applications along with the suite too. In other words, Nero 9 Free Edition cannot be used to make or create audio CD, create or burn ISO image, rip or copy DVD movie or audio CD, edit or author DVD, and many other functions on Nero 9 complete suites are been removed. However, Nero 9 Free Version, with only Nero StartSmart Essentials, can satisfy the need of many people who simply wants to backup data files to disc, or duplicating CD or DVD discs. 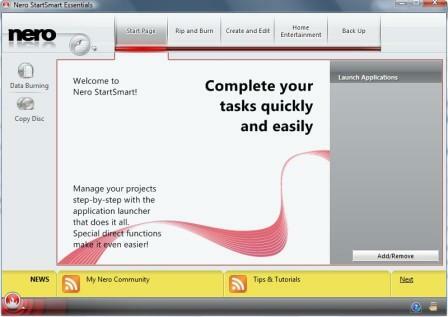 The only upside is that Nero 9 Essentials Free Version can be used for unlimited amount of time without restriction. NOTE: To keep your system clean, it is recommended to deselect the Ask.com toolbar options during the installation. No Nero 9 serial number, product key, activation code, nor crack or keygen required for installation. 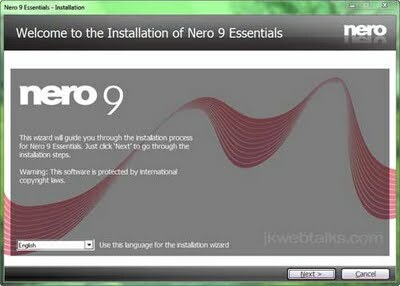 The free Nero 9 Essentials is a 55 MB download, and supports both 32-bit (x86) and 64-bit version (x64) Windows XP SP2 or SP3, Windows Vista, Windows 7, and Windows XP Media Center Edition 2005 with SP2. Note that the Nero 9 Free Version setup will install Ask.com Toolbar, and it’s recommended to deselect Ask.com Toolbar option during the installation.